The Headquarter for the improvement of the investment climate in the Ryazan region was held on the 21 December, 2017 under the chairmanship of Deputy Governor of the Ryazan Region Oleg Bulekov. The meeting was attended by the heads of regional ministries and agencies, Ryazan region Corporation of development, representatives of public organizations and the business community. The Council for Investments of the Ryazan Region was held on the 19 December, 2017 under the chairmanship of Deputy Governor of the Ryazan Region Oleg Bulekov. The Council on the implementation of priority projects (programs) in the Ryazan region was held on the 12 December, 2017 under the chairmanship of Deputy Governor of the Ryazan Region Oleg Bulekov. The territory of advanced socio-economic development was created in the settlement «Lesnoy», Shilovsky district, Ryazan region. The Prime Minister of the Russian Federation Dmitry Medvedev signed a Decree on the establishment of the territory of advancing socio-economic development «Lesnoy». 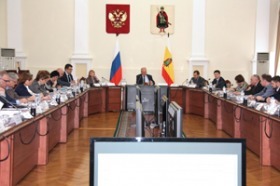 The Council for Investments of the Ryazan Region was held on the 7 November, 2017 under the chairmanship of Deputy Governor of the Ryazan Region Oleg Bulekov.